McHenry County Sheriff's Department. Man drives off road on motorcycle, officer smells alcohol at hospital, writes DUI ticket and suspends man's license. Blood test drawn at hospital. Man suspended for 6 months. RESULT: Suspension thrown out after hearing. Village of Algonquin. A Village patrol officer and a training officer clocked a car traveling 103 miles per hour on Randall Road, the driver was arrested for speeding and DUI. RESULT: Not Guilty DUI, not guilty speeding. City of McHenry. A man was found sitting in front of a truck in a parking lot. The police arrive smell alcohol and after a request by the man, call an ambulance. The State filed a petition to suspend. RESULT: After hearing, Suspension thrown out. State Case: Man visiting grave of brother at night. Police arrive see man enter pickup truck. The police smell alcohol, perform field sobriety tests and claim defendant failed. State files petition to suspend. RESULT: Suspension thrown out after hearing, DUI case dismissed. Wonder Lake: Man strikes telephone pole while in pick up truck. Police arrive at scene of accident, driver tells them that someone pulled out in front of him. Police smell alcohol, perform field sobriety tests which they claim defendant failed. State files petition to suspend. RESULT: After hearing, Suspension thrown out. Case proceeds to trial. Description: Officer claims man speeding, swerving, and making jerky stops. Description: Officer claims man driving all over the road, performs one field sobriety test, driver refuses all other tests, vomits in squad car and sleeps at station. Description: Man with two previous DUIs stopped by police for allegedly not stopping at a stop sign, failed field sobriety tests, no breathalyzer. Description: Young man just graduated college concerned about DUI on his record. Description: Man stopped at seatbelt check, officer smells alcohol, claims driver failed field sobriety tests, no breathalyzer. McCullom Lake: Woman pulled over for swerving. Had DUI two years previous. Police conducted field sobriety test which they claimed defendant failed, defendant refused the breathalyzer. RESULT: Case Negotiated. Charges reduced to Reckless Driving, Suspension thrown out. No jail. 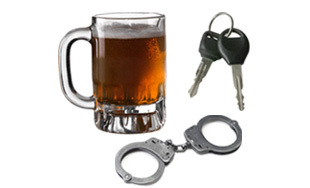 About 900 drivers in McHenry County are charged with DUI each year. I have represented McHenry County drivers for twenty-three years. Each case is handled personally by myself, and my clients receive my personal cell number so they can easily contact me with any questions. I met with Ray following an arrest for DUI. He was very informative about my case and possible outcomes. He was able to negotiate favorable terms considering my situation, saved my license and job. Highly recommend! Every time I need Ray he answers right away. Last time i had court. I sent him a text that morning and he said he would meet me at the court room. I was there because I was pulled over because my license was suspended and i didn't know it. Ray just swooped right in there, i was the first case and all i had to do was pay a long lost ticket! I don't think any of this would have been so cheap and fast with out you. Thank you again Ray :) I don't know what my family would do without you!!! I would definitely recommend Raymond Flavin if you need a lawyer! I have used Ray several times for a dui and other traffic tickets. He is fast, efficient, and he has always won the case for me! I have even called Ray the night before my court appearance for a ticket and asked him to represent me, and he was there! I used Mr. Flavin for a couple small cases and he treated me as I was one of his largest cases. Was never blind-sided on a financial point, and never in the dark in my case. Mr. Flavin treated me as a friend and took it personal which was not what I was expecting. It's comforting to have someone on your side and that will fight from the heart. I have used Mr. Flavin for a couple of traffic cases. He was exceptional in his handling of my case and kept me informed all the way. He also saved me a good bit of money on my fines. Ray Flavin did an excellent job on my case. I found his fee to be reasonable and his approach very professional. But the most important thing is we won! The best Damn Lawyer I ever had. He got on my case and delivered on me not getting punished for a DUI. How he did it I have no idea but I will recommend him to anyone and everyone. Mr. Flavin was the best lawyer I have had the pleasure of working with, and I've worked with a few. He responded almost immediately to my questions and is a great supporter and cares. I recommend him for any situation you may unfortunately be in. first time I called him he was confident that we would win our case. He was on top of his stuff and was able to finish my case within a couple months instead of a year or longer. Ray always kept me informed on what has going on and made it clear that what ever the judge was saying I understood it. Every time I have any questions about anything Ray knows what to do. He has been our family lawyer my whole life. If he can't work with you, he knows exactly who can. Ray has helped save my family a lot of money and still will work his best to settle for the best deal. Thank you for all of your help Ray!! The title says it all. 3 Times busted and never lost my right to drive, not even for a day. And at a price I had to take. Fast, efficient and CHEAP!!!! I've been busted 3 times now and have a clean record. The insurance company doesn't see anything because there is nothing on my record. Talk about easy. I called Ray the next day, and I'm in court in a week.. I go to the front of the line with his other clients, it was like the water parted as court started. My 3rd time and I don't even have to go to school, I paid a small fine and got on with my life. And like I said it was CHEAP!! I didn't have to go on a payment plan, here's a check, thanks, see ya! I have used Ray a couple times. Ray is very professional and personable, Ray takes his time to go over the case with his clients and dose not just push them out of his office. Ray has a thing about not dragging on cases if possible, he likes to go in and resolve the case right away if that is possible, Ray is also very prompt with returning phone calls and answering any questions you may have. I will continue to use Ray for all my lawyer needs and will also continue to recommend Ray for all my family and friends that may need a great lawyer. He has won the case every time I have used him. THANK YOU RAY U ROCK.. I used Ray for my DUI, we went to trial and he got the charges dismissed, the trial was over in an hour he is phenomenal. I saved over 4,000 dollars in fines. Ray "saved" me twice. Enough to say I was headed to jail....walked, every time we were in court. Total of about 12 times. No offers asked for straight demand for trial. Man alleged to have struck wife in the face after she fed his dogs chicken livers which gave the dogs the runs and found by police on top of his step son struggling to gain control of a police baton. RESULT: Not Guilty Jury Trial. No offers asked for straight demand for trial. Man alleged to have stuck his ex-wife's husband during a custody swap, while nosy neighbor looked on. Nosy neighbor called as first witness by the State. DISCLAIMER: All cases on this page are actual results. Your case may differ. Each case or DUI is unique and a change in the facts, driving history, or prosecutor can change the expected result of a case.